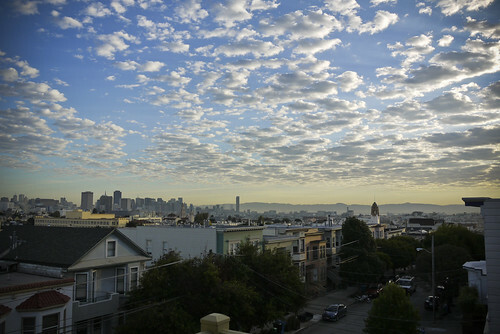 San Francisco Travel Guide: In the Magazine : bonappetit.com. 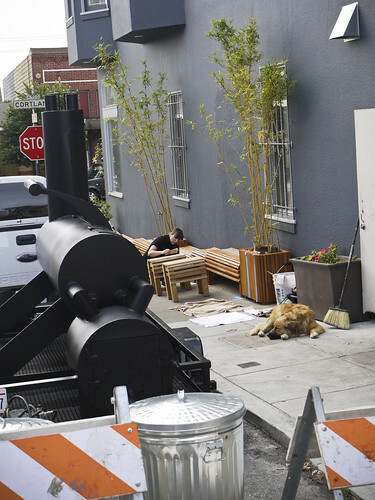 What To Expect at Smitten, Liquid Nitrogen Ice Cream Shop – Plywood Special – Eater SF. Anxiously awaiting the arrival of what could be the best ice cream store in the City… Smitten. Check out the story linked above for the details about this venture, which will entail ice cream made-to-order with one of four liquid nitrogen ice cream machines. Smitten is part of a greater project called the Hayes Valley Proxy, a network of shipping containers that will form a food court of sorts in this very cool SF neighborhood. From Delfina Pizza to a Suppenkuche beer garden, this is going to be an excellent foodie destination! Andy Goldsworthy’s art is candy for the eyes and food for the soul. His work makes real the magic that I like to think lives just under the surface of the earth, almost like there’s been a tear in the veneer of “the Normal” and a little magic has erupted from it, from the invisible to the visible. Goldsworthy installation in the Presidio, SF: "The Spire"
So, when I read via Matte Gray’s journals the tantalizing first-hand report of a new Goldsworthy art piece under construction here in San Francisco, I had to jump on the scooter and get over to the Presidio to check the site out for myself, with the tantalizing possibility of meeting Goldsworthy himself in the back of my mind. (Gray did, after all.) That didn’t happen, but I did meet the Bird Lady, which was fantastic! And I found two solid bakeries along the way. Yum. The ride took me very close to a Russian bakery that I’ve been wanting to try for a while, so I took a slight detour to check it out. 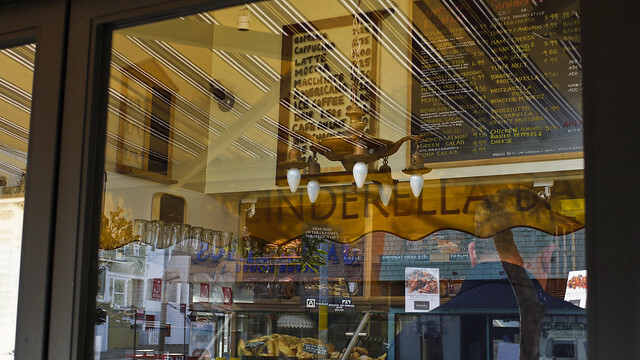 The name is Cinderella and it’s located at 436 Balboa St (between 5th Ave & 6th Ave). 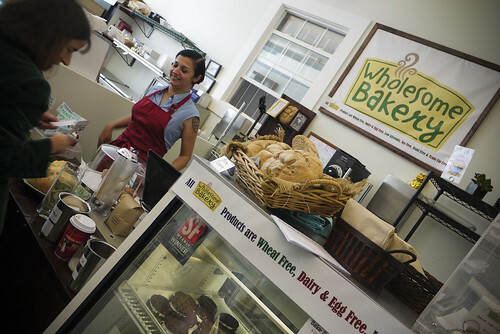 The space is small and wide, with sweet pastries generally on the left and savory on the right. Standouts include gorgeous danishes, hamentashen and other fruit-topped pastries but the distinguishing feature of this place appears to be the savory, especially the extensive variety of piroshki, hand pies sort of like British pasties. I bought a potato piroshki for later that night. 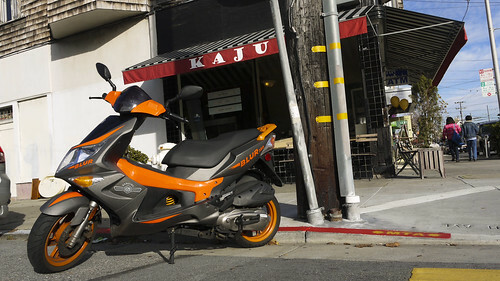 Then, to my surprise, near the intersection of 7th and California, I saw a bakery with a familiar name, similar to that of my scooter. The place was Kaju and I stopped in to check it out. While the interior is rather nondescript, (uninviting in fact) the owner was friendly and a glance at the food suggested an interesting mix of standard coffee and cookies, scones and the like as well as some uniquely Asian offerings. As a sample, I picked up a triangle of sushi-styled rice stuffed with avocado called onigiri. Wrapped, it was the size of a sandwich and an interesting alternative to the same, easy to throw into my backpack. I also got a house-baked organic chocolate chip cookie. The onigiri has the same mouth feel as the sticky rice used for sushi and was tasty and filling, great fuel for the rest of the afternoon. The cookie was the prize, one of the best chocolate chip cookies I’ve had all year. Nicely chunky, medium sized, crisp on the outside and chewy in the middle. There was a ’roundness’ to the flavor that I loved, but which couldn’t quite identify, that made every bite irresistible. . . could there be a secret ingredient in there? But I was losing the afternoon light by now so I didn’t linger. 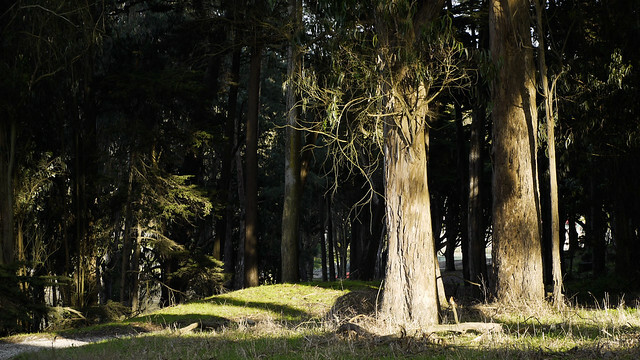 I started scooting around the edges of the Presidio and first, had to stop at the older Goldsworthy there, the Spire. Seeing it is a spiritual experience for me, a temple among the trees. 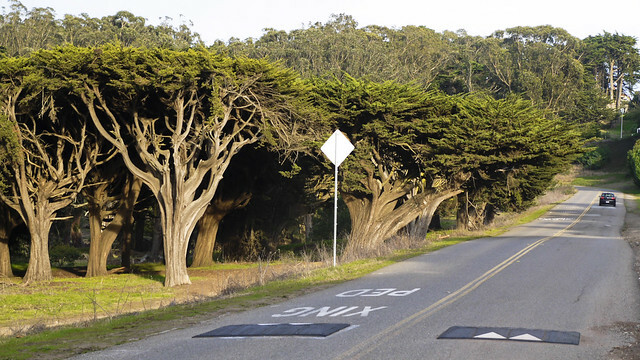 I’d found enough information about Wood Line to know that I was fairly close, but I had to travel from the Arguelo Gate (site of the Spire) to the Presidio Gate. I could have walked, it’s about half a mile, but I was losing the light fast by now. Back to the scooter! But not before checking out a beautiful, natural grove of majestic (magical) trees right across the street from the Arguelo Gate. 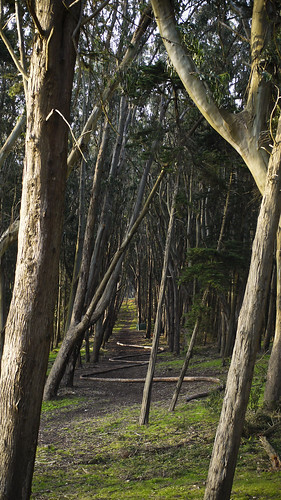 From here, I followed a winding road to the Presidio Gate and found the Wood Line immediately. Or rather, the sign for it. The installation wasn’t apparent until I got off the scooter and went over to the sign and, from that vantage point, saw a gap in the forest dead ahead along a single sight line. Felled timber creates a lovely, snaking curve on the forest floor, with the trees reaching upward on both sides like the support columns of a gothic cathedral. It’s a spiritual place. It’s ephemeral, too. The forest will reclaim the wood through natural decay in about 25 years or so. . .
And I almost forgot, while I was enjoying the Wood Line, a woman offered to take my picture in front of it on my scooter. We started to chat and I soon realized the woman was more fairy than person. Her questions were punctuated by her quick looks up to the treetops, and the occasional bird call. 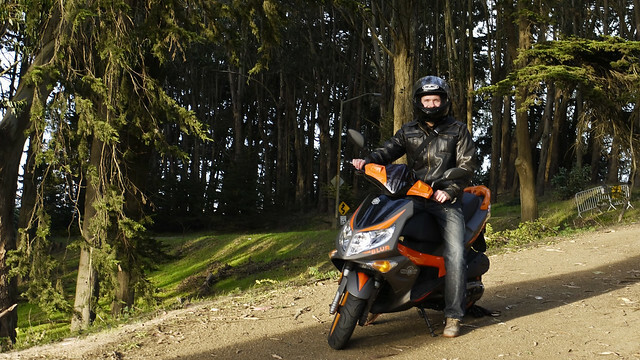 She explained she’s a birder, and visits and follows the birds of the Presidio daily. Or, they visit and follow her. She talks to them. They talk to her. And as fast as she appeared she vanished; she heard the tweet of a bird and with that, had to go. She danced-skipped-floated away, down the dirt path into the forest, and was gone! The light was nearly gone, too, so with that, I mounted Kaiju and . . . vanished. >> LINK HERE: Chinese Takeout Artist – Feature – Top Stories – CHOW. Follow the link above for a great article on local celeb chef, Danny Bowein. What you’ll find is a colorful profile of the guy, and the food, that we love so much. Here’s a link to my review of Mission Chinese Food, and the venture that preceded it, Mission Burger. My only regret is not having checked out Mission Street Food while I had the chance. 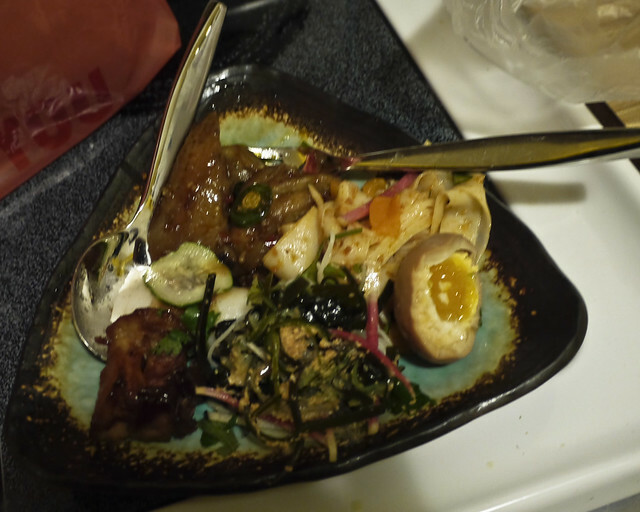 This was Bowein’s weekly “pop-up” restaurant (a restaurant within a restaurant) in the Mission, which featured a different menu every night, inspired by the fantasies of Bowein, his partner Anthony Myint, and other guest chefs. Then as now, a portion of the profits has always gone to charity, reinforcing the belief of the owners that success can benefit not only the business itself but also the broader community around it, as well. 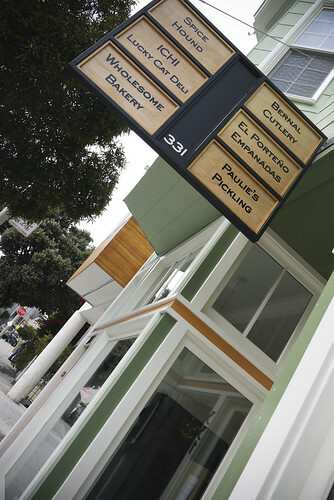 As you can see, within the last year the guys have worked on three different restaurant concepts (not to mention Myint’s Commonwealth, near Mission Chinese Food) so it comes as little surprise that towards the end of the article, a tantalizing hint suggests that Mission Chinese Food too may soon give way to another concept. While I’ll miss Mission Chinese, I have no doubt the greatness of the next venture will make me feel ‘a little less bad’. MUS-e-YUM does 3-SUM . 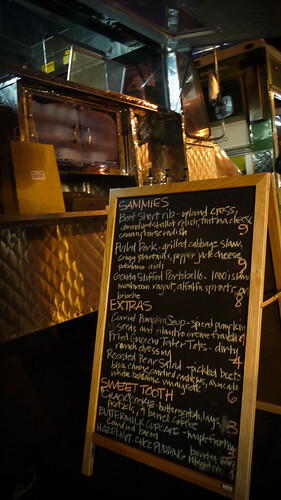 . .
3-SUM-EATS, the new venture by Top Chef Alumnus Ryan Scott, made its debut tonight at Off the Grid/Haight and despite the rain, and despite feeling unwell, I made the trek because the menu sounded so good . . .
Ryan, you had me at the fried gnocchi tater tots, in your dirty ranch dressing, no less. 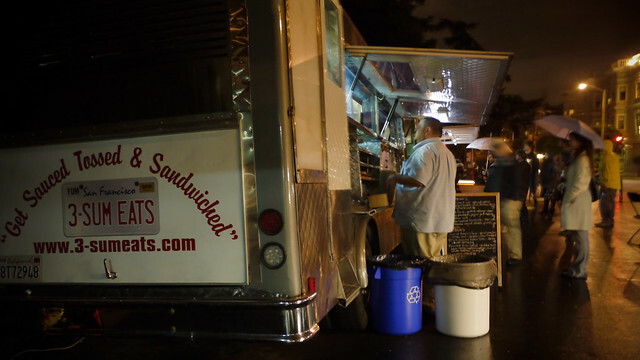 And, frankly, you had me when I heard the name of your food truck. But then, there was more. There was the beef short rib sandwich. the Roasted Pear Salad. 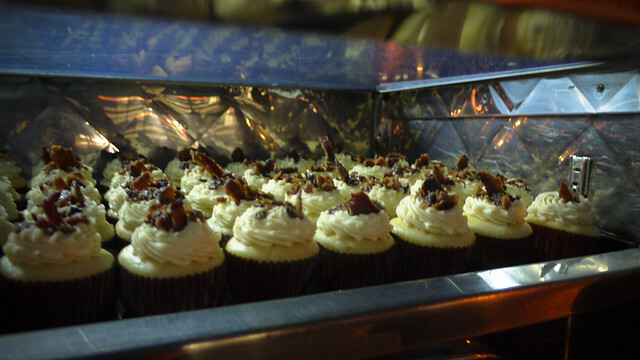 The maple/ bacon cupcake. THE CRACK COOKIE. 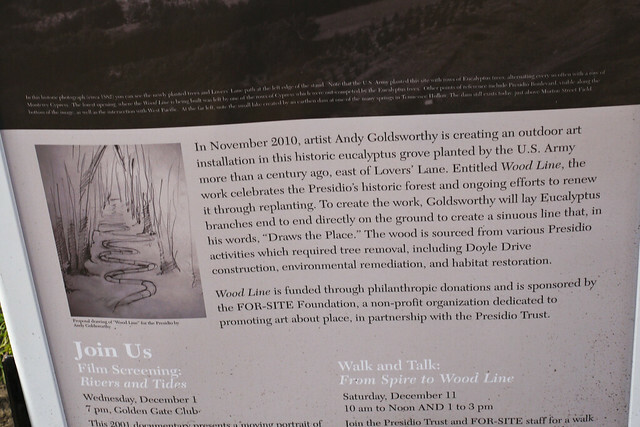 concept sketch for Andy Goldsworthy installation in San Francisco's Presidio, "Wood Line"
We love the artist Andy Goldsworthy here at MUS•e•YUM so when the intrepid Matte Gray posted news of a new Goldsworthy installation in the Presidio, Wood Line, we were more than thrilled! ((LINK HERE: note, once at matte gray, scroll down the page to journal entry 18 November 2010.)) 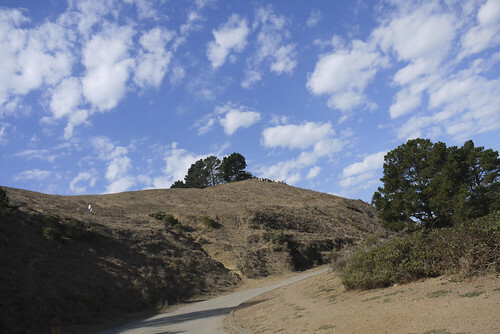 Just as Matte did when he learned of the building of Goldsworthy’s previous Presidio installation the Spire, the intrepid reporter has once again made the trek to the Presidio in order to scout the site via Segway, camera in tow. The last time Goldsworthy was working in the Presidio Matte actually met the artist on site, and the account of the experience is well worth a read on his blog (see story here, scroll down to 17 October 2008) More great updates and photos are sure to follow as Gray documents the final phase of construction of the new piece, so keep checking back. And it wouldn’t be a bad idea to read down the page a little bit further to the 31 December post for some great information about buying chocolate. . . you really oughta. Great art inspires. 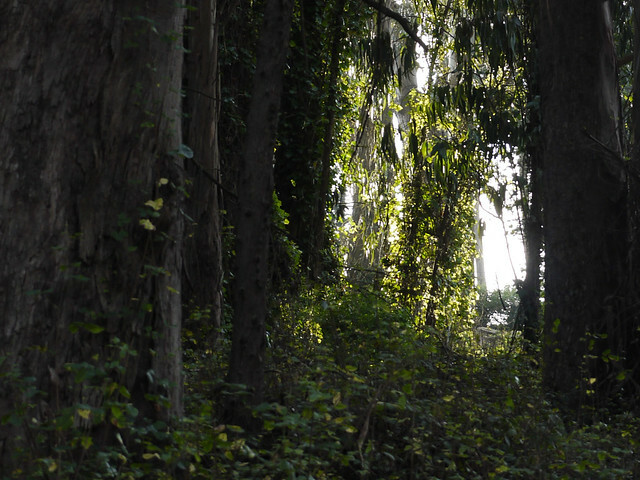 . .
Last year my great friend Deena took me to a favorite spot of hers, a grove in the Presidio National Park where the forest opens to a beautiful panorama of San Francisco, right in front of you. It’s a spiritual spot, and a meditative one. It was easy to see why she brought me here. When it was decided that a monument to should be installed here, only one artist could do a place like this justice, celebrating but not changing it: Andy Goldsworthy. So, in 2008, he built SPIRE. 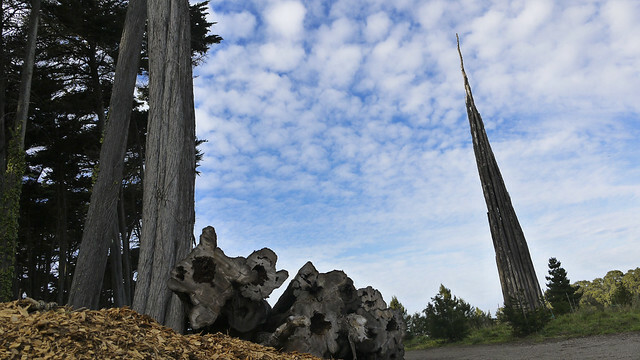 The amazing thing about this monumental sculpture, made of timber lashed together 90 feet high, is how effortlessly it has become part of the scene. It blends right in. This is a hallmark of Goldsworthy’s work, he incorporates natural materials from the site in which he’s working and from them he creates beautiful, fanciful and ephemeral art. Here, he took trees that would be felled (for the safety of the environment) and then used only that timber to make the sculpture. Part of the art is not only the finished state, but also the manner in which it is, in turn, reclaimed again by Nature. And will the sculpture last a minute? Two? Months? Years? That part is left to Nature, too. 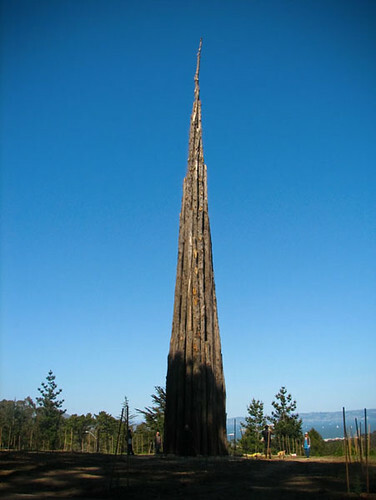 There is another Goldsworthy I want to tell you about, much more subtle than Spire. It’s the crack in the foundation of the de Young museum, Faultline, 2005. For this commission he created a zigzag crack in the hardscape outside the museum. The crack is a ‘path’ from the roadside to the entrance of the museum, but also serves as a subtle reminder of the seismic activity latent in the ground underneath, a characteristic of this place in the world. Unless your eyes are directed to it you might not see it but when it’s pointed out, the impact hits you immediately. Check out this great article about that piece, here. I’ve since become a fan of his. 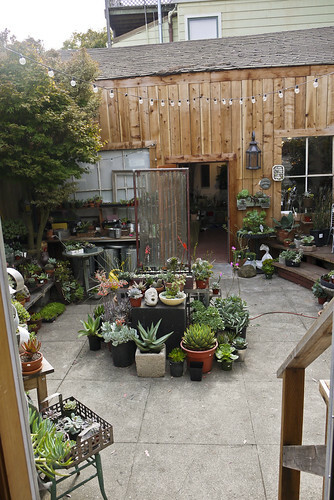 I was so inspired after having seen Spire I created a mini-version in my backyard garden. For mine I reclaimed dead bamboo shoots from my friend’s garden, and the Hancock Spire was born! Not willing to stop here, I wanted to try another one. I had my opportunity when my neighbor knocked down their retaining wall and threw away the cobblestones. Thus, I gained ‘site-native’ materials for another project, and I built a zigzag ‘Faultline’ of my own by setting the stones directly into the ground, and emanating from my Spire! 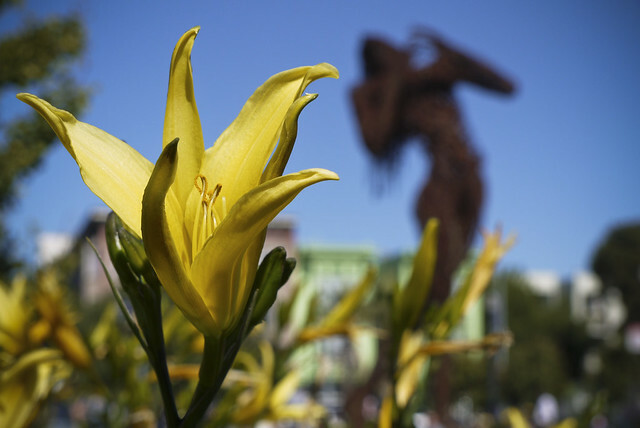 My exploration of the public art in Hayes Valley, Ecstasy in Patricia’s Green, (link to post here) reminds me of the monumental and inspiring Spire. While the scale of both projects certainly inspires awe, simply by virtue of their height which forces the eye skyward, they also are partnered in my mind because of the artistic process behind them. While they differ in the sourcing of the materials, Ecstasy made from man-made objects while Spire is made from felled trees, both make from found materials sing. These monuments speak to how repurposing an everday object, even a discarded one, can imbue the art with an added significance and intrinsic beauty. the designer installing new benches at Sandbox; gorgeous work! I went with the chocolate, hazelnut, almond cream and sea salt bun. It was really good. A woman after my own heart, the super-friendly and beautiful owner of Wholesome Bakery is also a motorcycle rider, -heart!! The goods here are wheat, dairy and egg free. 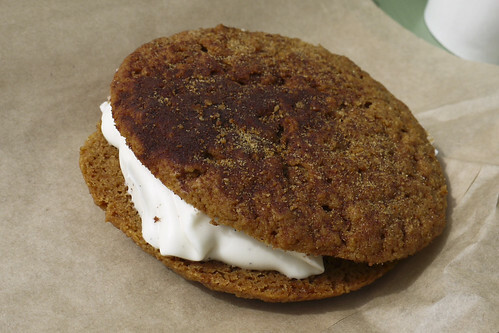 why yes, I'll have a snickerdoodle sandwich to go with my chai, thank you! 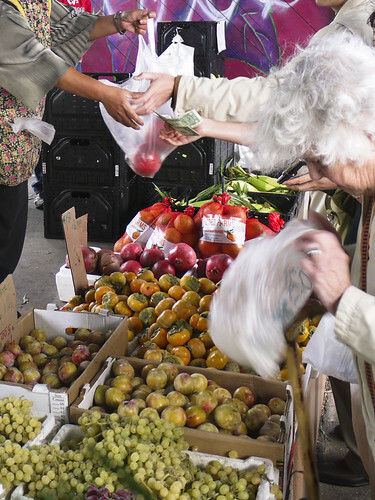 if you're in Bernal Heights on a Saturday morning, check out the Alemaney Farmer's Market! 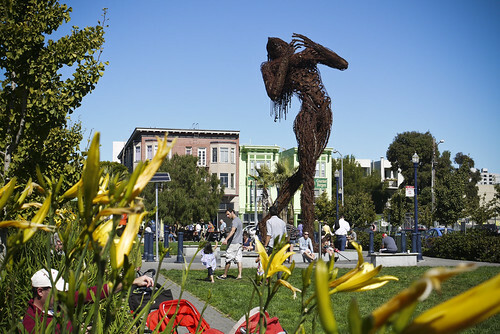 I discovered this IMMENSE six ton, 30-foot figurative sculpture while taking a scooter ride from Civic Center through Hayes Valley back to the Castro. Created by Dan Das Mann and Karen Cusolito, her name is “Ecstasy”. . . 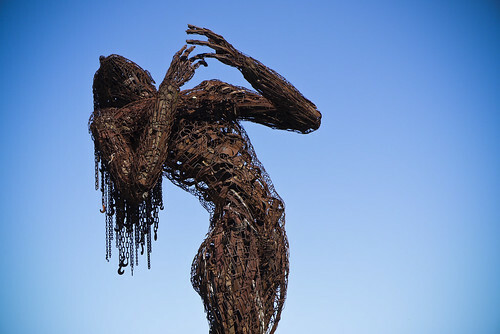 Assembled from discarded pieces of scrap metal, this sculpture has a kind of “recycled” life that transcends the composition of her body. The statement is powerful. I am always moved when someone makes something new from something old, discarded. 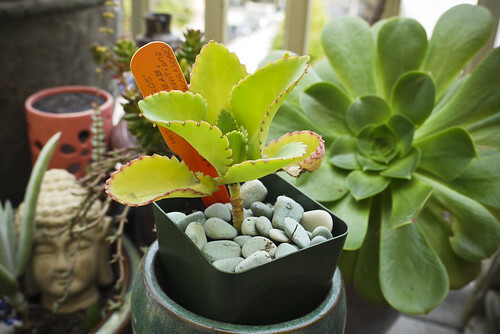 It’s what I’ve been trying to do in my own garden, too. All it takes is to allow a change in perspective and context. Imagination. And with that, something gains a new life. As inspiring as it is, the sculpture is just a temporary resident of the park. ‘Ecstasy’ is on loan from the Black Rock Arts Foundation through December 31, 2010. Patricia’s Green, the park that serves as the home for Ecstasy, is relatively new. 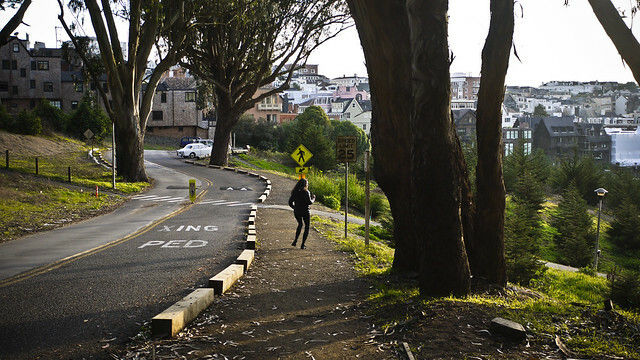 Not far from the Hayes Valley Farm, this stretch of Octavia, too, was renovated by the city in 2005 with the goal of beautification, and fostering pedestrian traffic and community-building. Thus Patricia’s Green was born. 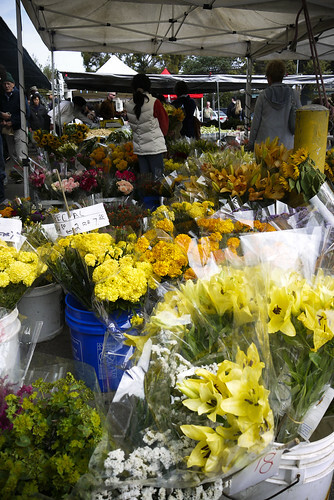 The Green includes not only benches and food carts, flower beds and playgrounds but, early on, the community decided it should be a venue for significant public art, as well. 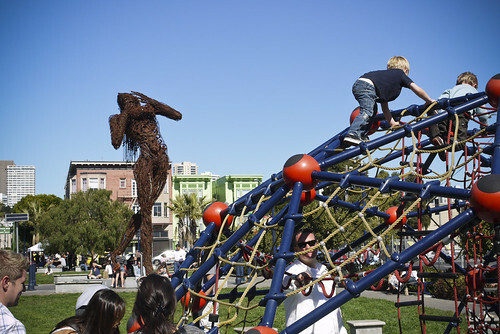 Residents and business work together via the neighborhood Hayes Valley Arts Coalition to curate the art that will serve as a beating ‘heart’ for the neighborhood. Thank goodness everyone involved saw the street and overpass that used to cut through this neighborhood and envisioned something. . .else. A farm. A park. Art. Not unlike the Hayes Valley Farm mere blocks away, Patricia’s Green, and the arts program that serves it, provide another good example of how neglected public space can be repurposed by transforming what was “broken” (and “deadening”) into something that is its opposite: one that is beautiful, that is functional (and function-ing) and one that brings people together. I love that. 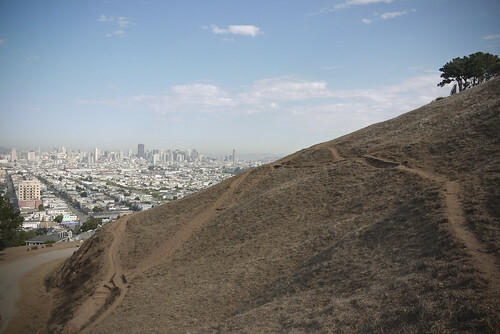 San Franciscans are good at doing it! Ecstasy — Black Rock Arts Foundation. 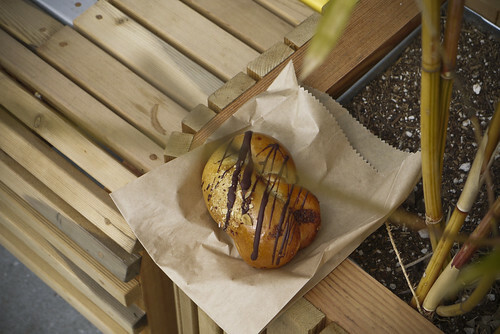 a charming, wonderful video celebrating a bakery in my neighborhood, Tartine. It’s a love letter to bread! I love this video! 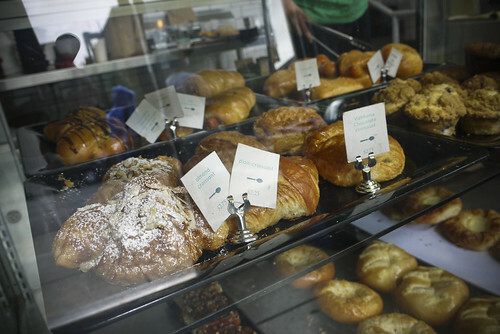 Tartine is a bakery just down the street, on 18th and Guerrero in the Mission District, and it’s a good one, too. The love and reverence the owner has for bread comes through so clearly and it certainly translates into the product, as well. After seeing the video, you just might find yourself inspired to try baking at home, too!